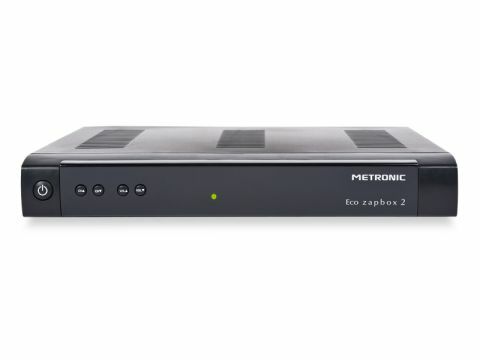 Listed by some vendors simply as the '441808', the headline features on the Metronic Eco Zapbox 2 are low power consumption and 'auto-retune'. The latter is a curiosity as the box doesn't automatically retune itself when updates are required. Instead, you're required to press a button (amusingly labelled 'SOS') for three seconds, at which point the automatic scan mode (accessible in the menus also) kicks into action. About the same size as an FTA sat receiver, the adapter is light, with an all-black finish and glossy front panel adorned by power, channel change and volume buttons but without any proper display to speak of, save for a single indicator light. On the rear sits a UHF loopthrough (there's no modulator for watching DTT channels via UHF if required), two Scarts (RGB is only supported on the TV Scart) composite video output and coaxial and phono connectors for audio. A low-power mode (on by default) lowers the amount of power the Zapbox 2 consumes in standby from 3W to 0.7W (it uses up to 3.5W in operation), but requires a longer power-up period. The remote design is functional, but we'd have preferred larger, more clearly signposted buttons for the most-used features. Channels are displayed as a single list with the option to lock, delete, move and edit them. Oddly, 'editing' doesn't mean renaming but changing numerical data for audio, video and PID data, which seems redundant for Freeview watchers. Just one favourites list can be created. Now-and-next data is displayed on the information banner, but not synopses (pressing info just brings up a page of technical data). A fast-moving, seven-day three-quarter screen EPG shows data in grid form for five channels at a time (again TV and radio are grouped together) with the current channel running in the top right next to a synopsis. You can skip day by day, set programme reminders and schedule up to eight timer events with once, daily and weekly repeat options. Pictures are reasonably solid and colourful with RGB Scart enabled, and a little fuzzier with the composite option. Audio is acceptable via the phonos and especially good via the coaxial digital audio option. The Eco Zapbox 2 has its share of operational quirks and isn't the most comprehensive adapter around in terms of features. But if your local reception is up to scratch it's a decent second-room DTT upgrade.